Iceland: the land of fire and ice, incredible views, and delicious fish. We’ve spent the past few days exploring this beautiful country and I wanted to share a few tips for future bucket list travelers. This post is the first of a few that will detail tips and my packing list. In future blogs, you’ll find details on what we did, where we stayed, and my personal recommendations. If you’re planning a trip to Iceland, you’re likely an adventure-seeker. This is not the place to come just to snap your photo at the Blue Lagoon and go home. Iceland is the kind of place you visit because you are a thrill-seeker and want to see something cool, something that feels maybe a bit out of your comfort zone. Be prepared for weather extremes. I’m from Indiana so I understand “dramatic” weather changes, but Iceland is a whole new level of ever-changing weather. It’s actually the third windiest country in the world (the north and south pole take spots one and two). Before you go venturing into the mountains, check the road conditions on this site and look at the weather for the day. If the locals are telling you not to drive, do NOT drive. Rent a car and get the extra insurance. Iceland doesn’t really have public transportation like some cities I’ve been to in Europe. You’ll also want to venture around the country and in general, the most affordable way to do this is by renting a car. Ring Road is the main road around the island and is fairly clear even in the winter months. That being said, rocks fly up on your windshield and you’re driving in a new country with a bunch of other tourists. The extra insurance is important to have, BUT it doesn’t cover door damage from wind or flat tires. At least at Northern Lights Car Rental, that was the case for us. If you have dietary needs, bring snacks. This is a general rule for me anywhere I travel because I get hangry, but snacks are always a good idea. Being gluten free, it’s not as easy for me to find food just anywhere. If I bring snacks, at least I’ll have some nourishment. Plan, but be flexible. Because the weather is constantly keeping you on your toes, it’s important to remember that tours can be cancelled due to inclement weather. I planned a few excursions for us and honestly, we just got lucky that the one day we planned to be in the city was the worst day of weather with 100 MPH winds. I’d suggest planning 2-3 tours if you’re visiting for six or more days. At least then you might have the chance to reschedule if something happens. Some tours can be planned when you arrive also. Get an international phone plan. Verizon has this cool thing called Travel Pass for $10 per day and it’s great to use for Maps. I prefer Apple Maps over a GPS any day because it’s what I’m use to and it’s easier for me to use. It’s also nice to have in the event that you need to call for help because you’re stuck on the side of a road somewhere. If you want a laid back trip, Iceland may not be for you. As I mentioned earlier, this has been an adventurous trip. It’s not for someone who wants a relaxing vacation. This is very much an on-the-go type of place filled with adrenaline-pumping excursions. Iceland is expensive. Everyone has different ways they prefer to travel. I like to be in a hotel, drink wine, go on tours, eat at local spots, and enjoy myself without having to worry too much about penny-pinching. Don’t get me wrong, we are always watching our budget, but we didn’t want to drive around the island and sleep in our car (which, yes, some people do here). The food, the gas, the drinks, it’s all pretty pricy. It’s also misleading because Iceland operates on Icelandic Krona so the conversion can be difficult to grasp at first glance. For example a cocktail might be 2190 ISK which is about $19 USD. If you’re like us, then I’d suggest budgeting around $1000 to spend once you land for a week long trip. This also depends on what tours you plan to take, but more on this in a future post. Pack layers. On our first full day, we drove the Golden Circle and I wasn’t dressed warm enough. I needed snow pants and my heaviest winter coat so that we could have hiked a bit more in the national park. It was also insanely windy at Gullfoss and the snow pants would have helped. Layering in Iceland is the best way to dress, but also layering for the weather. No matter when you come, you’re going to want some kind of jacket that blocks wind. Let’s chat a little bit more about What to Pack for Iceland. In all of the posts I read, I felt like this was a bit unclear especially for winter months. During the day, travelers are exploring which means hiking gear, boots of some kind, and heavy jackets. For dinner, most spots in Iceland are “nice.” I’d say the equivalent most of you might be familiar with is Bonefish so you’ll want to bring sweaters and dark denim for dinner. Below I’ve included photos of what I wore, plus links to some of the items I took with me. You’ll also find a few things below that I wish I would have brought. Let’s just say, long underwear saved my life and I wore them everyday under my pants. What I needed, but didn’t bring: snow pants, warmer gloves, and thicker Smartwool socks. If you bring layers and focus on being warm and dressing for snow, wind, and rain, then you’ll be golden. You’ll have your coat on most of the time so no one is going to know how many times you wore that pullover or those long underwear. For those of you who are adding Iceland to your bucket list, it’s incredible and I highly recommend it. I’m looking forward to sharing more on our experience, but I wanted to share tips for visiting first. 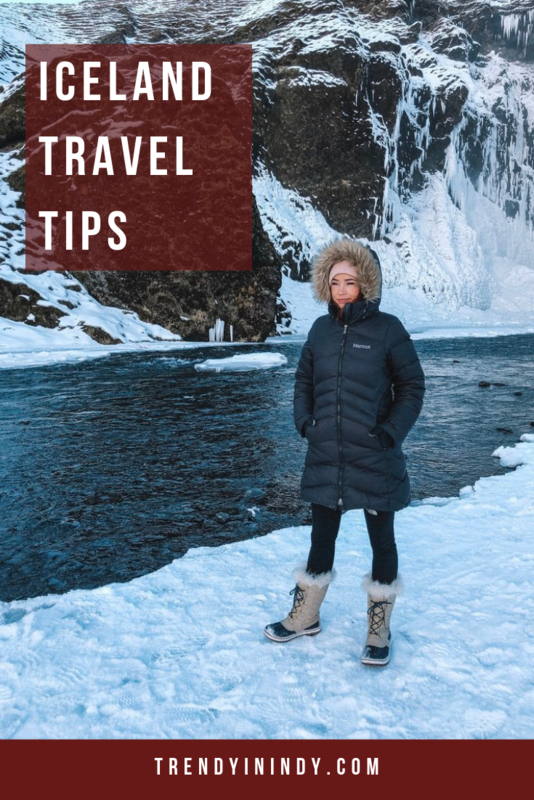 Loving these tips and what to pack for Iceland? Click here now for more of my essential travel tips! !